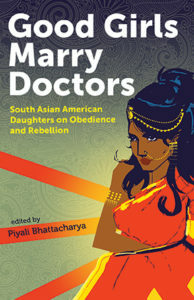 I sat captivated in a featureless lecture hall, absorbing the compelling autobiographical events that shape Good Girls Marry Doctors: South Asian American Daughters on Obedience and Rebellion as told by the authors themselves, and quickly realized my minority status. As one of only two or three white men in the audience, it was apparent that I did not represent this new collection’s target audience. After all, do the crowded shelves of Barnes and Noble really need yet another narrative on the plight of suburban white folks? The savvy women of Good Girls have not written that narrative, and face the possibility that their specific plights may well pass unnoticed by the mainstream. Instead, editor Piyali Bhattacharya and the more than two dozen other writers of Good Girls share their candid stories with those readers who can relate to the fraught relationships that young people navigate when their ideas about the future fail to align with those of their parents; they open their hearts and mouths to those who have faced abuse and feared the consequences of breaking silence; they speak to those who have faced the complex emotions of parenthood and friendship and sexuality and career choices; and they tell their stories with aplomb and brutal honesty for those who care to listen. And readers would do well to listen, as these marginalized voices ripple with eloquence and wisdom while remaining broadly relatable. My mother called me from that lonely house, her voice shattered. Mostly, I kept the situation with my parents at a distance, but at the end of a long night, I felt like a tightrope walker who suddenly looked down to find the net had been cut away. Suddenly, everything was off balance. I believed that power came from intimidation, from making others know fear as I did. I believed it came from taking over bodies – from occupying them as we do landscapes – with the intent to obliterate all that is magical, wild, and free. Without recognizing it, I had adopted the language of my father, the dominant language of the world. A few pages later, we witness helplessly as her father easily strips both the weapon and the power it wields from her hands in vivid detail. The simple, one-word title of Natasha’s story coincides powerfully with the stark and visceral images on display as she recounts that confrontation with her father, her chosen words hacking and slashing at the reader’s consciousness the way she imagines her switchblade might cut her father or anyone who threatens her. I think about how complicated life is and how complicated (my mother and father’s) life together must have been. Mom had been so upset in those last few months before she died, at Abbu, at life. And I, too, had been upset for so much. But as we sit around that grave, I feel none of the bitterness I had before, and all the assumptions I had about us as a family not making it to this point have dissipated. There is a serenity. There is a calmness. The anger is gone… All that is in its place is compassion and forgiveness. The women of Good Girls Marry Doctors did not write their stories for me, and yet I had the good fortune to find and enjoy them. After reading these varied and wonderful stories, I feel like a good friend has let me in on a little secret – or a huge one. Having been granted the privilege, I’ve discovered that the wounds and revelations documented here strikingly resemble those I have heard from my own friends. These personal vignettes remind us, importantly, of the universal nature of the human condition in colorful, painful, honest, funny, and relatable language that transcends demographic and cultural boundaries while faithfully expressing the unique struggles felt by this community of women. In this nation of immigrants, these brave and wise South Asian-American daughters provide an unblemished mirror for all American sons and daughters to gaze into and see our true selves, vulnerable and wonderful, reflected. Danny O’Neill has been accused of being an average middle-aged white fellow who lives with his nuclear family and their dog in rural, northwest New Jersey. He could not be reached for comment.